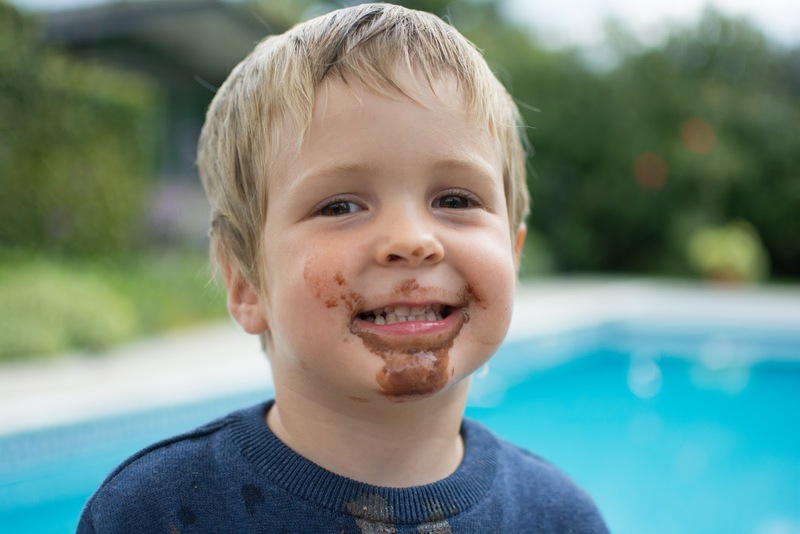 A few weeks ago I spotted that Mum In The Mad House was running a competition with Two Little Fleas asking bloggers to write about the fun their children have being messy. I think that one of the greatest joys of being a child is not caring if your clothes get covered in dirt or your face is smeared in food. Throwing yourself with gusto into all that you do. Whilst we don’t seem to do a lot of messy play at home (somehow we just never get round to it!) Theo has a family who love food and we seem to have an awful lot of pictures of him getting messy whilst helping cook or when eating the results, always with a big smile on his face! So for my entry to the competition I thought I’d put together a little compilation of some of my favourite messy moments with him. I promise he doesn’t spend ALL his time eating ice-cream, no matter if the evidence seems to say otherwise! This is why I never dress my kids up in something if I have to say ‘don’t you’ll get messy’. Messy kids are creative kids. I have a 2 year old boy and a 3 year old girl and each have only two formal outfits! I tend to stock up on plenty of inexpensive essentials that I know wash easily, and while I have a few messy related rules for my kids to help educate them on good hygiene and good manners (not wiping bogies on their shirts and washing hands before eating) other than that I’m very laid back when it comes to my kids making mess. P.S I loved your video!